What in the world is that thing Mable? I don’t know Fred, but slow down. It must be alive because it’s moving. Look’s like a go-cart with a flag. Hey Mable, I think there’s a person on it. Yep, lookie there, a guy is pedaling, but it’s not a bike. No Fred, it has three wheels. I’ve never seen anything like it before! Poor fellow … must be some kind of a fancy wheelchair. He must be handicapped Fred. I’ll move way over Mable and give him plenty of room. Gotta’ give the fellow credit though. Most people in wheelchairs don’t travel out on the open road like this. There’s no doubt about it! Tadpole tricycles are indeed an attention-grabbing bizarre form of transportation, three wheeled vehicles powered by humans seated only inches from the asphalt. They’re low, fast, and so unique that motorists and pedestrians can’t help but take a moment to check them out. In fact, their strange appearance is the major factor why these machines are often safer than bicycles in traffic situations. Bicycles are so commonplace for most drivers that they don’t call on the person’s brain to pay attention or make an identification. Trikes, on the other hand, being rarely seen, immediately bring drivers to a more lucid state, demanding their attention, and a need to identify. Automobile drivers are further amazed when they are witness to a trike heading down a long and steep mountain pass road, where speeds of 45-50 miles per hour are readily attainable as the pilot simply coasts along in his reclined bucket seat. At those speeds, trikes are incredibly stable, instilling confidence in the rider, and awe in the motorists who are attempting to determine if they should pass the trike, or just pace it for a while for the show. 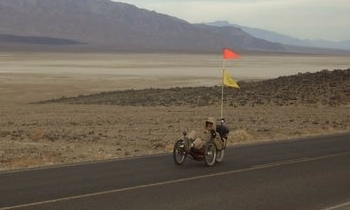 Some drivers report the thrill of simply watching the trike rocket down the grade, an electrifying experience that is magnified multiple times for the person actually piloting the machine. One might think these speeds dangerous, yet with three wheels nearly eliminating any chance of serious mishaps, such as could happen on a bicycle if a tire gets tweaked by a pothole or rock, fast rates of travel become times where a triker’s smile can easily strain the physical limits of the face. Flying down hills only eight inches from the ground becomes the ultimate adrenaline rush. At fifty miles per hour, the mind is fully concentrating on the here and now. There is no room for agonizing over the past or worrying about the future. Difficult as it is to describe verbally the account of rapid downhill descents for the uninitiated, suffice it to say that they come as close as one could imagine to racing a Lamborghini through the curves under full power. Trikes are race cars with organic engines: YOU. Clearly, they are as far removed from wheelchairs as one might imagine. However, this common image of a handicapped person on the road often becomes an asset for the trike pilot, for motorists frequently are more inclined to proceed carefully when they believe a less fortunate person is struggling to make it through life without a car. It requires considerable bravado to use a wheelchair on the highway, after all. Drivers may form another opinion though if they see a triker pulling away from them in exceptionally tight downhill turns, where a car might actually be the slower of the two vehicles. Interestingly, the first tricycle was reportedly invented in 1680 by a German watchmaker who was disabled. This crafty fellow wanted to remain mobile despite his failing lower body, so his invention was powered by hand cranks, rather than today’s usual method of foot cranks. Then, in 1789, a pair of Frenchmen developed a foot-powered cycle with three wheels, and coined the term “tricycle” to differentiate it from an ordinary bicycle. Finally, the British got into the act during the 1800s, and the efforts of two men, separated by 54 years, led to a regional revolution in England. Reports claim that by the end of that century, twenty trike manufacturers were producing more than 120 models to satiate the needs of the world’s first corps of trike pilots. It should be noted that trikes are still available today with hand cranks for those with limited lower body abilities. That old German would be proud. It should further be noted that yours truly rides a British trike, such was my fascination with the region where the trike really took off. Actually, don’t believe that last sentence! I was offered a real deal on my wheels, and snatched it up on the spot. Of course, had not the sterling reputation been there already, I would not have purchased it. The British know how to build trikes. You get what you pay for, and I wanted a trike that will outlast me. Trikes have three wheels, thus their name of tricycle, or a cycle with three wheels. Many people still call these rigs bikes … it’s hard to break old habits. They just see what appear to be bicycle parts on a weird looking contraption and their brains bring forth from the gray matter the only thing they have experience with, which is a bike. If someone asks me if I ride my bike much, my typical response is that I haven’t ridden a bicycle since I was a teenager (Schwinn Stingray by the way). As a tricycle ambassador of sorts, I feel obligated to help the habituated masses learn new tricks, difficult as that challenge may be. Locomotion, as defined by Webster’s Dictionary, is the act of moving; the power to move from place to place. Trikes, if viewed from above, are essentially triangular in their shape, thus the trike is a form of triangular locomotion. Riders of trikes generally think outside the box, which is the shape of a car. I no longer own a box. Confining my mind in those boxes for so many years led to a serious case of clinical normalcy, a boring condition that has been happily defeated with my triangle. There are two basic styles of tricycles. The most common in most folks’ minds is called the delta trike, as these are the kind that little children have ridden since the beginning of trike time. I started out on a delta trike when I was three. My parents must have gotten rid of it though because I can’t find it anywhere. Bet it would be worth some money nowadays! Adult delta trikes are available for those who prefer two driving wheels in the rear, and only one steering wheel in the front. Tadpole trikes have only one driving wheel in the rear, and two steering wheels in the front, with the exception of one brand that uses the rear wheel for steering and the front two for power. Traditional tadpole trikes require about 17 feet of turning space, and are stable since the front steering wheels have limited angular articulation to the direction of travel. This stability can be quickly understood by rocketing down a steep curvy road on the tadpole. 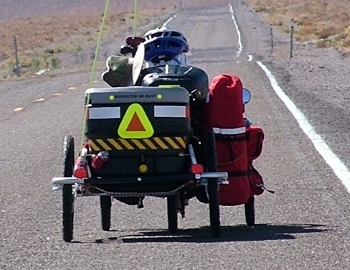 The front two wheels act like outriggers, counteracting the forces of the cornering, which want to send the trike to the outside of the curve, thereby leading to a dangerous rollover accident. The outside front wheel prevents this from happening, assuming the rider hasn’t lost all semblance of reason while attempting to outperform the laws of physics. There are limits to everything. A tadpole can be flipped if pushed beyond these limits, but with a little cautious and studied learning curve, common sense tells us where the point of no return is. One day, when I was just learning how to operate my trike efficiently, I went for a cycling ride with two guys on mountain bikes. We stayed on the pavement. 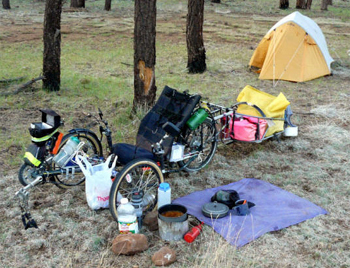 One fellow put on about 100 miles every week, and was very serious about his biking. We were following him on his weekly route. On one particularly steep and tightly curved downhill road that reduces auto travel to about 15 miles per hour, he leaned way forward, picked up speed, and sent the non-verbal message that he was going to race to the bottom, a half mile below. Being the competitive guy that I am, I decided to join in his fun. The third fellow of our group, being the genius of the three, chose to play it safe and take his time. He liked the way his teeth fit in his mouth. My racing buddy ahead, a veteran downhill speed freak, glanced back to make sure he was out in front all by himself. He got a surprise. I was literally right on his tail. Any closer and my front chainrings would have been ripping slices out of his rear tire. He turned his face forward, doubled his resolve, and upped the ante. After all, a new guy on a trike shouldn’t be able to match his pace. He knew this road like the back of his hand. It was my first time on it. I mentally moved outside my comfort zone, kept my hands off the brake levers as much as I could stand, and maintained my position just off his starboard side. He glanced back again and put full steam ahead. I began to fall back a bit, but then realized I had to make a statement about trikes, so I moved back up despite my fears. When we got to the bottom of the long forested downhill, he slowed to a stop. As he put his foot down, I was parked to his right. Of course, being the gentleman that I am, I made no mention of this secret desire of mine to clean his clock because I was not able to pull into the lead at any time. The best I could do was match his speed. Sixty seconds later, our other pal pulled up. Now, before any bicycle riders reading this say that trikes really aren’t faster on the downhill than bikes, keep in mind a couple of things. First of all, being new to triking back then, I didn’t realize the value of leaning into the curve. Had I aggressively thrown my body weight to the inside, perhaps I could have pulled ahead slightly. But then again, maybe not. It was tight, with little room to squeeze by on the very narrow roadway. Secondly, in really tight turns, the bicycle has the advantage because the rider can lean aggressively to reduce the forces of straightness, but on long and steep downhills with wide sweeping curves or straightaways, the tadpole trike will almost always easily take the lead. Of course, this really frosts the cakes of bikers. This is because the wind resistance on a low trike is much less than someone on a bike. My friend’s rear end was several feet in the air. Mine was only eight inches off the asphalt. He was all hunched forward leaning on his wrists, creating a huge wind trap under his chest that affected his speed. I was comfortably reclined to 37 degrees off the horizontal, allowing all that wind to skim right over the top of me. Bicyclists have to worry about hitting a little road irregularity or rock. Trike pilots have three wheels and don’t fall over at speed if the ground gets rough. But hey, I’d rather be only eight inches from the landing zone rather than several feet if it ever did happen. This online Trike Asylum realm focuses on tadpole trikes. When first looking at trikes to buy, I did contemplate for a while acquiring a delta trike because I had one manufacturer who was willing to deeply discount a model that was no longer being produced, but I reconsidered when I asked if he had ever flipped one of his delta designs. The owner said that he had gone over a couple of times, but it’s not a point of worry. Well, once I began thinking about deltas in this way, I opted out of that design, and landed squarely in tadpole country. When in a tight fast turn on a delta, there is no leading wheel to act as an outrigger. The rear outside wheel helps, but it is too far back to make it as useful as a tadpole design when the forces begin to exceed the delta’s design limits. Hence, I became a tadpole man, even though I like the sound of the delta word better. I didn’t like imagining myself as a juvenile frog, but after I realized how capable the tadpole is while cornering under load, I soon forgot all about wording, which, in reality, is nothing but some human-bestowed naming convention that means absolutely nothing. Perhaps I should have called this website “Tadpole Trike Asylum” but that is too long and sounds too weird. Of course, Trike Asylum sounds pretty strange also, and I have been told by several normal people that it makes us all seem like we are in some kind of establishment for the psychologically distressed. So be it. I like my trike. It is my asylum, a place of retreat and safety from a hostile world bent on self destruction. The trike is my escape to the freedom of peace, happiness, and solitude. It makes no noise and emits no poisons. It is my magic carpet ride into an alternative reality. Experienced trike pilots likely realized my preference for tadpoles just by viewing the first page of the blog, as there are no deltas to be seen. I have no experience on a delta, so I chose not to include it here. I like my writing to be experiencially based as much as possible. Besides all these rationalizations, there is a certain indescribable “cool” factor to tadpole trikes due to their ultra low and wide design, something very akin to a fast race car, that demands an “Oh man, is that ever cool or what?” response from just about anyone who sees you coming. This is my trike asylum, an alternative world of triangular locomotion, and I welcome you to it with a smile and friendship, even if you do not yet own a tadpole trike. So what kind of things do you look for when considering a trike? Well, let’s talk about that for a while. The first major thing that catches my eye is the quality of welds on the frame. Welding well takes practice, patience, and skill. Not everyone or every company can do a great job of it. 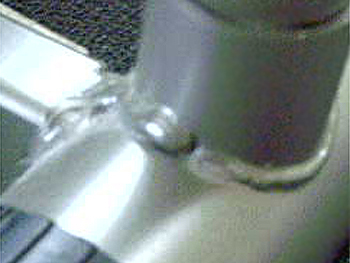 Sloppy welds look like big blobs of dried and painted glue along the weld line. There will be gaps here and there, and the height of the weld varies as you sight along its length. There may be splatter around the weld, pieces of weld material that was not cleaned up. Most people never give welds a second thought. They figure if the frame and parts are in one piece and the product is being sold, it’s good enough for them. I don’t think that way. Weld quality is important in two ways. First and foremost, a top-notch welded seam is very strong, and far less likely to crack or break over time or under heavy stress. 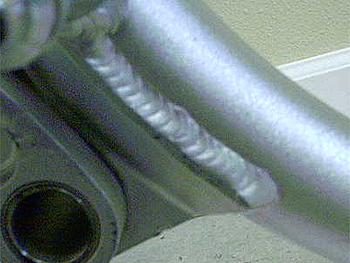 If you want a trike to last over the long haul, get one with beautiful welds! This brings us to my second point … beauty. Not only is a high quality weld strong, it looks nearly perfect, like the two adjoining pieces of metal were mated together in heaven. 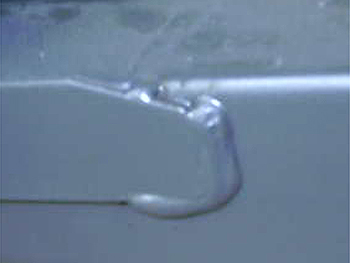 If a weld is pretty to look at, it is most likely exceptionally strong. Cheap companies usually don’t take the time to do welds right, either that, or don’t hire professional welders with many year’s experience. 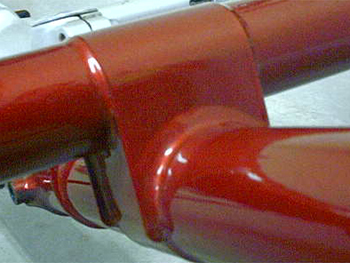 Fine looking welds on high quality trikes demonstrate the company’s pride of craftsmanship. 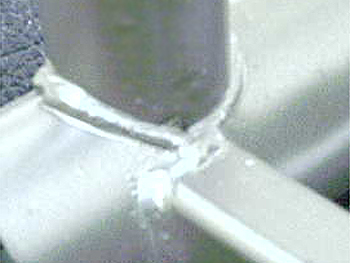 The welds should be the starting point when assessing various trikes. On my trike, called a Q, which is engineered and made in Britain by Inspired Cycle Engineering (ICE), the welds are flawless. Each small section is nearly identical in appearance and structure to the ones next to it. The welds are smooth and flat. It is almost like the metal pieces are all one piece, that’s how good they are. I can run my finger over a high quality weld like this and it feels very smooth to the touch, with no irregularities protruding along the way. Start looking at welds and you’ll see how much different companies vary in their quality. I figure it like this: If a company doesn’t even take the time and effort to lay down excellent welds, then I’m not even interested in their product. If they cheap-out on the welds, what else have they cut corners on? If they pass the weld test, then they likely go the extra mile to do things right. Welds are an indicator as to the trike’s overall quality in my opinion. If the welds are nice to look at, then it’s time to consider other aspects of the trike. Most trike companies have the paint thing down pat nowadays, but there are still differences. Some paint jobs are glossy smooth and deep, while others are smooth but seem shallow to the eye, and yet others may have what is called an “orange peel” appearance, which looks like hundreds of miniature dimples in the paint coat. Some folks love the orange peel texture, while others see it as a sign of lesser quality. Assuming the priming and painting proceedure was sound, this may only amount to an appearance issue. It seems like the majority of people prefer the slick look of a perfectly smooth paint job with a quality clear coat on top. This makes the paint look like you can actually see down into it, whereas a cheaper job looks thin and somewhat lifeless … perhaps even dull. When I was considering the purchase of my Q, the two initial factors that spoke volumes to me were the weld and paint qualities. The thick and flawless paint atop the perfect welds told me that I was looking at a first-rate machine. Any company that takes that much pride in their product is probably one that I can count on to take me many unproblematic miles down the road. Speaking of many unproblematic miles down that road, if you’re going to ride long distances over varied types of road surfaces, there is another facet of trikedom that may be worthy of your study. To suspend or not to suspend … that is the question! What is the answer? Well, everyone has an opinion, so again, I’ll just toss out some thoughts based on my experience. Suspension, something that is taken for granted on cars and motorcycles, is not so common on trikes. For generations, bikes have been solid machines that transmit every road irregularity right up through the rider’s hands, wrists, arms, legs, and body. The only saving grace with a bicycle is that the rider can stand up on bumpy sections, allowing the leg muscles to absorb the shock rather than the spine, bones, and brain. On a trike, standing up is not an option. You’re sitting down as you would in your recliner at home, and with your feet out in front of you, it’s impossible to get out of the seat if a big bump is unavoidable or the road turns rotten. Sure, the seats have a certain amount of flex to them, but not enough if you are headed over five miles of rough pavement. My trike has rear suspension, so that when the rear wheel goes over bumps and irregularities in the pavement, it moves up and down by the means of rear swinging arms. As I have learned after hundreds of miles in the cockpit of the Q, this sure is worth its weight in gold. I prefer to be comfortable on long rides and tours, and suspension most assuredly goes a long way to make that possible. ICE is now offering models that also have front suspension, which can be installed onto my trike, and would be the next step up in luxury. Some companies offer varying degrees of suspension, while others offer none at all. I would encourage you to test ride both types of trikes before you invest your money. Make sure you have a good feel for what each kind feels like on rough roads. They all feel great on really smooth pavement, but on old roads, for example, unsuspended trikes may be more jarring than you’d like. I’ve been on roads with my Q that have been relatively unpleasant, and hate to think what those roads would have felt like if the rear of the trike was locked up solid. Also, among suspended trikes, you have options of what kind of suspension is available. Some suspend only the rear, some both front and rear. Some suspend using plastic elastomers, some use hydraulic fluid shocks. Elastomers are inexpensive and indestructible, and provide a nice ride. Fluid shocks are expensive and vulnerable to leaking, but provide a better ride. You must be the judge. How much money do you want to throw at this vehicle? How cushy do you want it to be? You’ll find guys who stay away from suspended trikes because some of the power of their pedal strokes is lost in the suspension. These are guys who want every possible ounce of speed they can get, and they buy specialized trikes made for the purpose. You’ll find people who say suspension doesn’t soak up so much power that it’s worth dismissing altogether, and that comfort is worth what is lost in power transmission. My take on this? I’ll go with the latter. 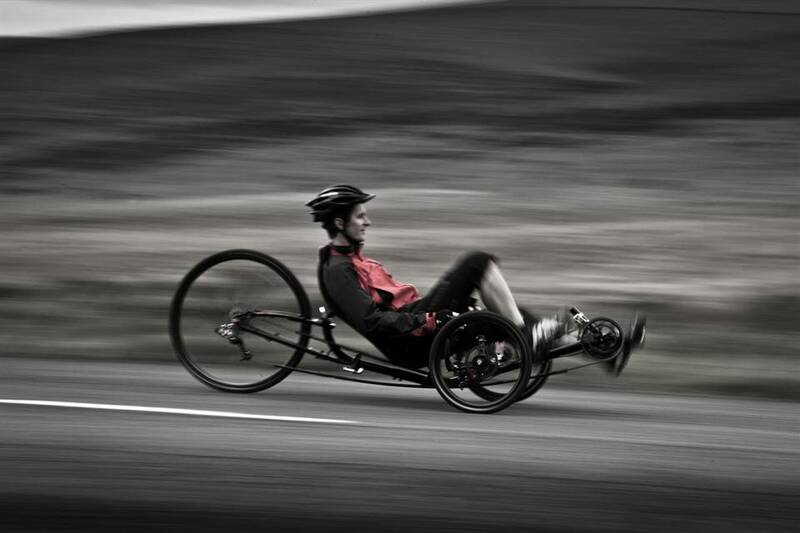 When you get going really fast on a trike, especially when you’re rocketing down a mountain pass at 45 miles per hour, you’ll want a reliable means of stopping your speed machine. Trikes don’t use caliper brakes like traditional bicycles do. On trikes, we find two basic types: internal drum brakes and disc brakes. The more expensive trikes often offer discs, some mechanical and some hydraulic. Mechanical discs are nice because there is nothing to leak, they are relatively easy to fix, and they are less expensive than their hydraulic cousins. I have Sturmey Archer internal drum brakes on my Q, which have always done a fine job of slowing me down quickly on steep descents when a tight curve looms large in my vision. This is the same British company that provided the three-speed shifting mechanism on my first bicycle in 1960, a green 26 inch Indian. They’ve been around awhile, and know how to build things right. My trike is upgradable to mechanical disc brakes, but lacking any significant reason to spend the extra money to do the job, I’ll funnel my finances towards other aspects of trike improvment, like getting the drivetrain gearing fine tuned for my particular needs. A common wheel size on trikes is 20 inches. Many trikes have 20 inch wheels all around. Some models will have a 26 inch or 700C wheel in the rear, which are much larger in diameter. What’s the difference? Well, for the potential trike pilot, it comes down to how you will use the trike most of the time, and what you will expect from it. Suppose the rear wheel of your trike is only six inches in diameter, a tiny little thing that would be laughable to anyone checking out your cool trike. For every revolution of that wheel, you wouldn’t get very far down the road. You’d be pedaling like a madman to even ride around the block … great for burning up calories, but lousy for taking a long trip. Now suppose the rear wheel is ten feet in diameter. For every revolution, you’d go so far that it would make your head spin. If there weren’t any hills, you could ride across the state lickity split. Mathematically, we could determine how many revolutions of the six inch wheel it would take to equal one revolution of the ten foot wheel, but I think the point is made. Larger diameter drive wheels allow for faster speeds on the flat, while smaller diameter drive wheels make it easier to climb hills. With the proper chainrings in the drivetrain, a 20 inch wheel provides a sensible compromise between high speed and mountain hill climbing. If you plan to use your trike on mostly wide open roadways with few high mountains, and want to go fast, opt for the larger rear drive wheel. If you plan to tour cross country, or live in very hilly or mountainous terrain, opt for the smaller rear drive wheel. Even a larger drive wheel can be made to play with hills well when the ideal chainrings are up front on the crankset and proper cog or sprocket sizes are on the rear cassette. This is one of the beauties of a trike. You can play around with these concepts of gearing right in your own garage using your own hands. To have a transmission specialist do these things for a car would cost a few thousand dollars, but trike pilots with a modicum of mechanical sense can modify their trike’s drivetrain characteristics for just the price of a few parts available at the local bike shop. And the feeling of pride that comes with knowing you did your own work is great! Get a book like Todd Downs’ “Bicycle Maintenance & Repair” and you will be ready to save quite a bit of money. Yes, I realize that the book says “bicycle” in the title, but I haven’t found one yet written specifically for trikes. In fact, trikes usually aren’t even mentioned in most, if not all, repair books. But not to worry! Eighty percent of it is the same. 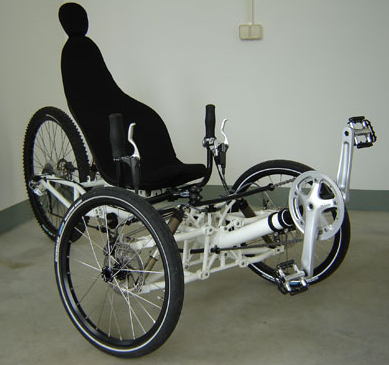 The same principles and parts are used on both trikes and bikes. The book has helped me immensely, and now I am ready to tackle any trike maintenance or repair issue that might come along. Of course, the good news is that even if you aren’t mechanically inclined, and don’t know the difference between a crank arm and a chain tube, you’ll still save a wad of cash when comparing a bike shop wrenching on your ride versus an auto mechanic doing even the simplest of chores to keep your car running. Cars are complicated black holes into which you pour thousands of lost dollars. 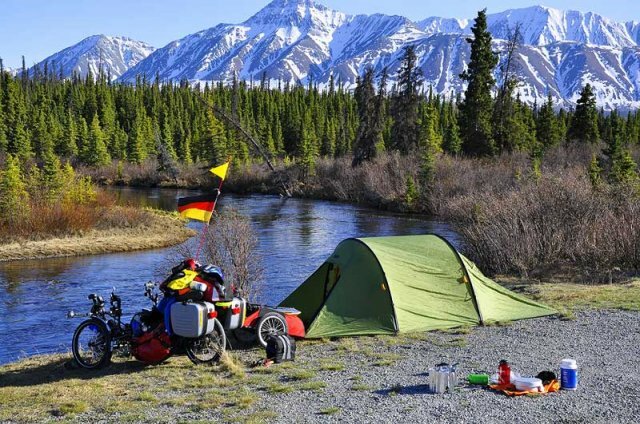 Trikes are simplicity defined, and will keep your cash available for all the food you’ll be buying on that next cross country trek. You can buy an unbelievable amount of trike parts, accessories, food, and supplies for what you’ll spend at the auto shop. I’d rather use my money to be out enjoying my planet on the trike, than lining the pockets of high priced service departments. Okay, I accidentally got up on my corporate and environmental soapbox, having diverged there for a bit, so let’s get back to things to think about when looking at trikes. We were talking about gearing, and how a larger rear drive wheel related to top speed. But put low gearing on a trike with a 26 inch rear wheel and it can defeat the intended purpose of the trike. I’ll walk you through my experiences with the Q as an example of gearing change, as it is something with which I have become very familiar. Understanding this can help in assessing which trike is best for you. For those new to trikes, a couple of definitions are in order. A cassette is what trikers call the sprocket collection on the rear drive wheel. Sprockets are also referred to as cogs. These are circular rings with teeth around the outside edge, which are engaged by the drive chain to propel the trike forward. My trike’s cassette has nine cogs, and is considered a nine speed setup. Each cog has a different number of teeth on it than its neighbors. When the chain is on the largest cog, or sprocket, it is capable of climbing steep grades. When the chain is on the smallest cog, it is capable of going fast on the flat. Of course, which cog is being used in the rear cassette is directly affected by which chainring is being used on the front crankset. The crankset is what you see at the very front of recumbent tadpole trikes, and is made up of three chainrings and two crank arms (upon which the pedals are mounted). The pedals turn the crank arms, which in turn rotate the chainrings. This moves the chain, which turns the rear cassette and therefore the rear drive wheel. Chainrings do the same job as cogs or sprockets. They engage the chain and mechanically move it in one direction. We just have different names for essentially similar pieces of metal. The three chainrings all have different numbers of teeth on their outside edge. Depending on which chainring and cog combination your chain is on, your trike will be able to climb hills or go fast. The smallest chainring is used for climbing hills or mountain passes, while the largest chainring is used for hammering down the highway at blistering speeds. The middle chainring is used most often for the widest variety of conditions. All right, back to the cassette and my personal experiences. The Q, with its 20 inch rear wheel, came from the factory with an 11-32 cassette on the rear. That means the smallest cog had 11 teeth, and the largest cog had 32 teeth, and the cogs in between were gradual increments between the two end cogs. My trike also came with a 30-42-52 front crankset from the factory. This means the smallest chainring was 30 teeth, the middle chainring was 42 teeth, and the largest chainring was 52 teeth. This gearing setup was a favorable compromise that would be useful to the largest number of typical riders, a time-tested combination that most people like. The Q nomenclature stands for “quick” so the gearing reflected that ideology. The company wanted most folks to have a good top end speed, along with a reasonable low end climbing ability. On my initial rides in the coastal mountains around my home, I found the 30 tooth small chainring was still too high for the really steep uphill grades, even when I had the chain on the rear 32 tooth cog. I was expending a fair amount of extra effort to make it to the top of steep inclines. This would normally not be an issue, but I was preparing for a cross-country ride pulling a trailer, where my overall weight including myself would exceed 350 pounds, so I realized this gearing had to be changed. My route included several high mountain pass roads, where the gearing would prove unacceptably demanding. The first modification included two things. First an 11-34 rear cassette was installed to replace the 11-32. An 11-34 is considered a mountain bike cassette, and those extra couple of teeth on the large cog make a big difference in climbing ability of the trike. Next, the 30 tooth small chainring in the front was swapped out with a 26 tooth for some practice rides. Four fewer teeth made a world of difference when I hit the really steep uphills. I also tried a 24 tooth instead of the 26, which again, made a noteworthy favorable difference. The 24 it would be, because once my loaded trailer was hooked up, I would definitely need it for those endless summits. I ran into a problem however. The crank shifted fine around town on the flat and small inclines, but on my first really steep uphill, it was not possible to shift down from the middle 42 tooth chainring to the small 24 tooth, even when pressure on the pedals was decreased momentarily to take the load off the chain. I had to make a U-turn and head downhill for a second to make the shift and continue on up. This, of course, was not good because I didn’t want to spend my days on the mountains riding in little ridiculous circles. Shifting early before I got on the hill would solve the problem, but with gearing this low, it would really slow me down much sooner than I would normally choose. The reason for the issue stemmed from the difference in the number of teeth between the middle ring and the little ring. A jump from 42 teeth down to 24 teeth is quite large, 18 teeth to be exact. They say you should not exceed a 14 tooth differential for good shifting, and 12 teeth is even better. Some folks say that a 16 tooth differential is the extreme outside for shifts of marginal quality. I had 18 teeth! That chain had to jump way too far to make it to the next ring smoothly. Jumps of 10 teeth between rings make for optimal smooth and fast shifts. The Q had a Campagnolo crankset, and I was unable to find a middle chainring solution to solve my problem. If I could exchange my 42 tooth chainring for a 38 tooth, that would make the jump to the 24 only 14 teeth instead of 18. Since I did not locate such a solution prior to my journey, I opted for a whole new crankset. The new one was a Sugino 24-36-50, which made my shifts easy, and allowed me to climb over many high mountain passes pulling my trailer. The only issue with it was that on some really long and flat valley roads, I would actually spin out, or reach a point where I could have gone faster if I had a larger chainring. Here, I needed that 52 that was on the old crankset. Everything is a compromise, it seems. Another problem with the Sugino was that it had only 152 millimeter length crank arms, which were considerably shorter than my Campagnolo’s 170 mm arms. The shorter the arms, the less leverage you have when pedaling up hills. It means that my legs were spinning the crank at a higher cadence to cover the same ground as the 170 mm arms would have done. I have since been told by many experts that the 152 mm arms are usually for folks with shorter legs (I am six feet tall, with a 34 inch inseem), or for people who just like to maintain a higher cadence, or revolutions per minute. For that trip in 2009, the gearing worked well, but since I have sold the trailer after learning the many drawbacks of pulling it over the six weeks, future trips call for another gearing change. For my purposes, I have now acquired a crankset with 26-39-52 chainrings. This is not as low geared as the former, but I won’t need a 24 now that I don’t have the trailer. The 39 is a nice midrange compromise between my former 36 and 42 middle chainrings, and the 52 will once again allow me higher top end speeds when the opportunity presents itself. With this new setup, my two jumps between chainrings are both 13 teeth, which put me in a good range for smooth shifting. The really sweet thing about all this gearing stuff is that performing these modifications is well within the reach of ordinary people like myself. I am not a trained cycle mechanic, but with a little understanding of basic gearing principles, along with a good book about maintenance, the simple technology on the trike makes it doable for me. In fact, I am having a great deal of fun tweaking my ride to just my own specifications, making it the perfect road and touring machine, a good combination of steep climbing ability and flat out speed. As you can see, when making trike buying decisions, there are some fine points to consider, items that may not be readily detectable by the ordinary joe. Of course, the good news is that most trike manufacturers figure that most people are not mechanically inclined or desirous of making changes, so they configure their trikes to meet the needs of most people most of the time. Experienced personnel at trike shops can help further refine which particular model best suits your needs. Most companies offer several configurations depending on how you will be using the trike. If you’re looking to purchase your first trike, or even upgrade from an old entry-level machine, your options are many today. In fact, there are enough trikes out there that it may well make figuring out which one a real challenge. But of course, that is all part of the fun! For a guy like myself, researching what’s available, talking to other riders, and learing all I can makes for many enjoyable days and weeks. The anticipation is as exciting as the acquisition. How much choice is there? Let’s look at but a few options for a minute. 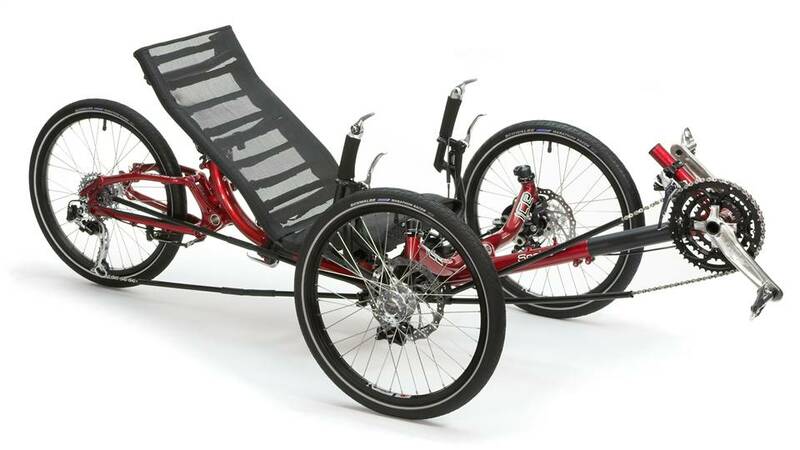 Catrike, a company based in Florida, offers models with names like Expedition, 700, Speed, Road, Pocket, Trail, and Villager. Their Expedition is geared (literally and figuratively), for folks who want to tour across the countryside. It has 20 inch wheels up front and a 26 in the rear. The 700 is aimed at the speed demon market, with 16 inch wheels in front, and a large 700C drive wheel, and will offer up some great thrills. The Road is similar to the Expedition, with the main difference being it has a 20 inch rear drive wheel. The Pocket is for people under 5 feet 8 inches in height, a smaller trike that fits smaller folks better than a full size. 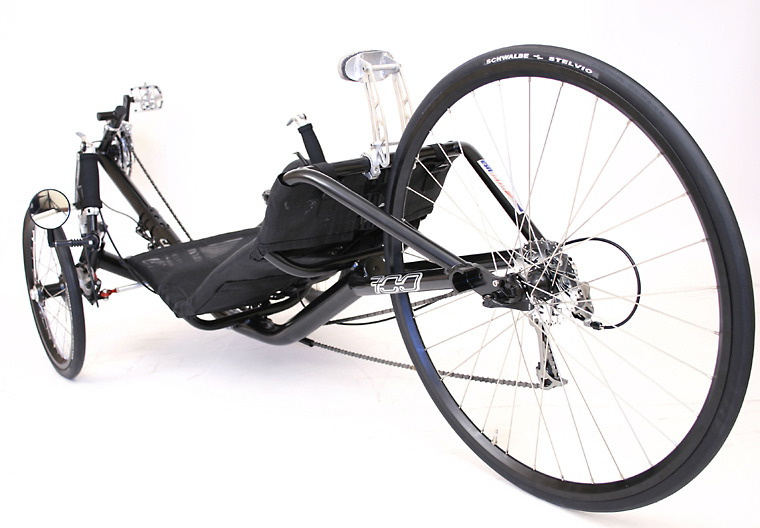 Catrike’s Villager is an entry level machine with a higher than normal seating position and a more affordable price. Even within these models, modifications can be made to the chainrings and cassettes to further personalize the trike to your needs. Greenspeed, a company based in Australia, also offers quite a few choice models from which to choose. They have a GT Series of folding trikes, so if you need to put the rig in your truck to go for a ride far away, the option is open. Their X Series of folding trikes is another notch up on the performance ladder, being created as sport trikes first. This series has lower seating, making for better handling at speed. 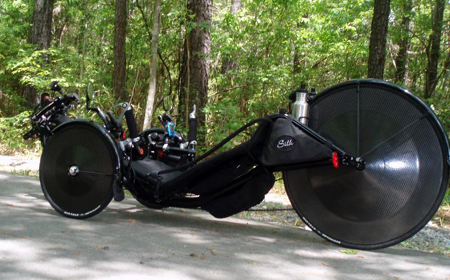 Then there are Greenspeed’s GTR and GTO 54 speed ultimate trikes, which have dual-speed internally geared cranksets. 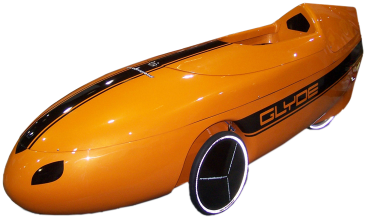 And, if money is no object, then the Glyde is an option, an enclosed trike called a velomobile that took 16 years to develop. HP Velotechnik, a company based in Germany, offers a few wild looking trikes with noteworthy German engineering. The Scorpion FS is a fully suspended folding tricycle. 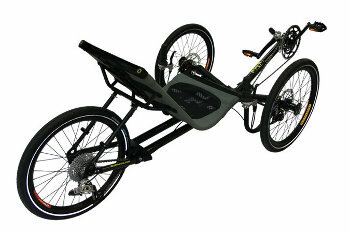 The Scorpion FX is also foldable, but unlike its race-bred cousin the FS, it is more suited for day riding and touring. Their strut suspension offers significant shock absorbing capability, which also increases the price. 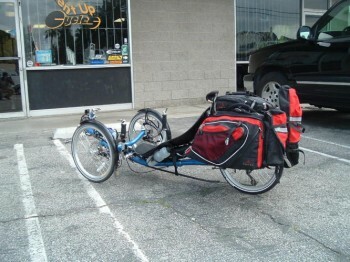 This company also makes recumbent bicycles, but we dare not mention them on a triker’s website! TerraTrike, a company based in Michigan (up there in the Great Lakes region), offers models like the Sport, Race, Path, Cruiser, Tour, and Zoomer. As with most trike companies, prices increase with such things like frame material, brake type, and other options. The Sport and Race have frames made of aluminum, which are lightweight and more rigid. The Path, Cruiser, and Tour have Cromoly metal frames. TerraTrike’s Edge is a carbon framed speed machine. TerraTrike is the brand that Dan Price rode 4700 miles from Oregon to Florida a few years back. 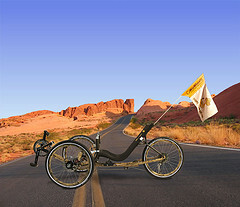 Trice, a company based in England, and known as ICE these days, offers three models of trike for the discriminating buyer. Their models were formerly called the T, Q, and S. The ICE T was a high clearance trail trike suited for off road use. The ICE Q was a low clearance quick trike suited for excellent handling and higher speeds on pavement. And the S was the next step faster than the Q, with a hard shell seat, increased length, and a more sporty feel. Starting in 2010, ICE has renamed these trikes the Adventure, Sprint, and Vortex respectively. They have also added options like front suspension to compliment their rear suspension. Other changes like a new rear swinging arm assembly are readily apparent to the veteren ICE man. One thing I like about my Q is the track width. At 27.5 inches wide, I can easily take it through a doorway. This aspect is well appreciated on very narrow roads with minimal shoulders, where I can keep my trike in a space that allows cars to pass more easily. My model is called the Qnt, with nt meaning narrow track. It was 4 inches narrower than the standard Q. From what I can tell from their website, the Q’s replacement (Sprint) has split the difference, and has a track halfway in between the Q and Qnt. What do you do if you have a partner who wants to ride too, but doesn’t want to go on two trikes? Well, get a tandem. The two seats are one behind the other. 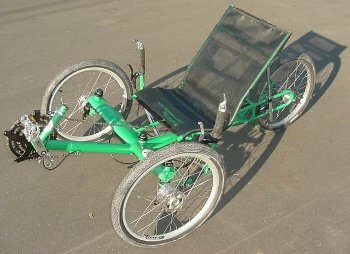 The trike still has two wheels up front and a drive wheel in the rear, but it is much longer than a regular trike. Greenspeed and TerraTrike offer tandems. These lengthy trikes would be best used on rolling open terrain with plenty of visibility due to their size. Prices are roughly double traditional single-person trikes. There are more trike companies out there to choose from, and this is where the hunt for the best trike to suit your needs comes into play. Spend some time on the internet and you’ll be amazed at what you’ll find. The small photos on the sidebar of each page on this website will give you a glimpse at what else is available, as well as all the links below the photos. The Beserker is touted as the ultimate off-road trike, and video proves their point. The Sidewinder is touted as the ultimate trike for getting around in really tight little spaces, with its rear wheel steering. 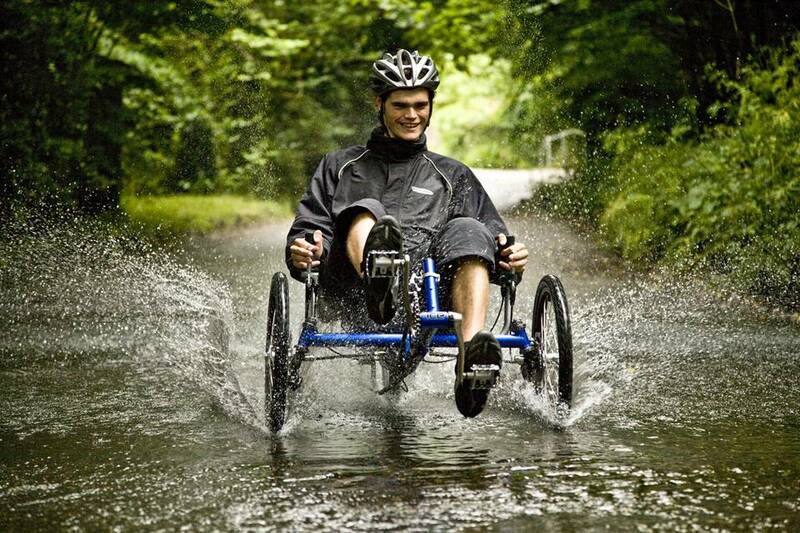 The Kerrel Trike is touted as the ultimate flexible trike, conforming to all manner of terrain on the fly. The Innesenti is touted as the ultimate carbon fiber race trike. One thing is certain. Whatever your triking needs may be, there is undoubtedly a trike out there with your name written all over it. The selection is enormous, and once you begin your search, you’ll realize that it may be far more difficult than you ever imagined when it comes to picking your match. Then, once you get the perfect trike for your needs, you can still customize further, and that’s when the fun really begins! Many folks are happy with their trike just as it comes from the factory. They just keep the tires pumped up and ride. Pretty simple. Buy it. Ride it. Have fun. When it doesn’t shift well anymore, take it to a bicycle shop and have them clean it up. Inexpensive. Easy. From a young age, I sat in my dad’s shop behind the house and watched him tinker with his motorcycles for years. He’d get things just right, a stickler for perfection. Pop didn’t like a bunch of chrome. Sometimes he’d have an item satin chromed, like the air filter chamber on his old British Matchless motorcycle, which was extravagant for him. He kept the chain, sprockets, cables and all other items in top condition at all times. My old man must have found a certain therapy in this meticulous work each weekend. It must have soothed his soul. Anyway, as kids often do, I picked up these traits and carried them over into adulthood. They never go away. So as it turns out, I am one who also enjoys doing my own work, keeping everything in tune, and calming my spirit with the tinker trait. Nature or nurture? Genetic or learned? Who knows, or for that matter, who cares? Now with my trike, I can do all my own major wrenching, along with all the modifications and upgrades I need. Trike parts are dirt cheap compared to automobile parts, so I am able to really tweak and personalize the Q for a minimal amount of cash, which is a good thing as I continue my opting-out of our culture’s runaway obsession with materialistic consumption. As with any vehicle I have ever owned, so it is with the trike when it comes to creating a clean and uncluttered look to it. If there’s chrome, get rid of it. If there’s advertising, make it go away. The Q has very little chrome, so that wasn’t an issue. Things like the quick-release levers, for example, are so small and inconspicuous that they are fine left as is. And as with automobile companies, trike companies like to place advertisements all over their trikes so that their customers will be advertising their products as they ride. My last vehicle, a Nissan Xterra, was loaded with these ads. With a little WD-40, patience, and a few soft paper towels, off came the chrome plastic emblems. Not a one remained. The car appeared to have a custom paint job when I got done … very slick looking. I took it to a tire company to see about new rubber, and the manager was looking all over the truck to find out what kind it was. No ads. I had to tell him. Besides the clean custom appearance attained by removing all that proprietary junk, I figure that I paid $28,895 for it so why should I continue to do Nissan a favor by being a rolling billboard? The ICE Q had a lot of advertising on it when I got it. Not quite as gaudy as an automobile by any stretch, but as I sat looking at it in my garage the first few days of ownership, I imagined what it would look like without all the decals all over it. And all those little stickers that told me about the space-age aluminum? I couldn’t help myself! Those simplicity genes forced me to forge ahead. These decals were not glued on like the plastic chrome emblems common to cars. All I needed was to carefully lift an edge with a razor blade, and then slowly peel each decal back at a steep angle to avoid tearing. Within a few minutes, my Q looked like a custom painted race trike. I no longer feel any allegiance whatsoever to mega corporate entities like Nissan, but with ICE, it’s a little different. Inspired Cycle Engineering is a small company compared to auto giants, tiny in fact. They are a bunch of helpful British guys who actually communicate with you personally via email or telephone. Try that with Nissan, which doesn’t give a rip about your personal problems. As a result, I do feel a certain loyalty to them, especially since they make one of the finest trikes on the planet. So, I felt bad taking off all their advertising just to have the custom look I wanted. I made up for it though! My conscious is clear. In the several hundred thousand words I have penned online in the past year about trikes and my trek, and in the photos I’ve placed with the writings, I have made sure that ICE receives their just dues. I link to them, mention the Q repeatedly, tell what a fantastic trike it is, how it hasn’t let me down, and tossed in pictures to show it in action … kind of like what I’m doing right now as you read these words! Based on my blogs’ stat pages, a fair amount of click-throughs to the ICE website have occurred, which is really better than showing their decals as I pedal by average people on the street who couldn’t care less about what kind of trike I’m riding. I write directly for viewership who appreciates the triking world, folks who will visit the new ICE site.